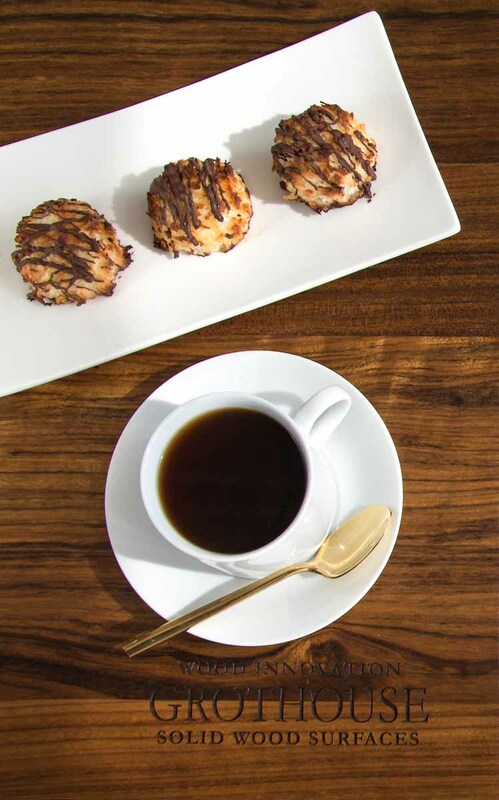 Walnut Counters with Cove Edges are the ultimate combination of beauty and brawn – a strong, durable wood complete with a bashful edge profile. 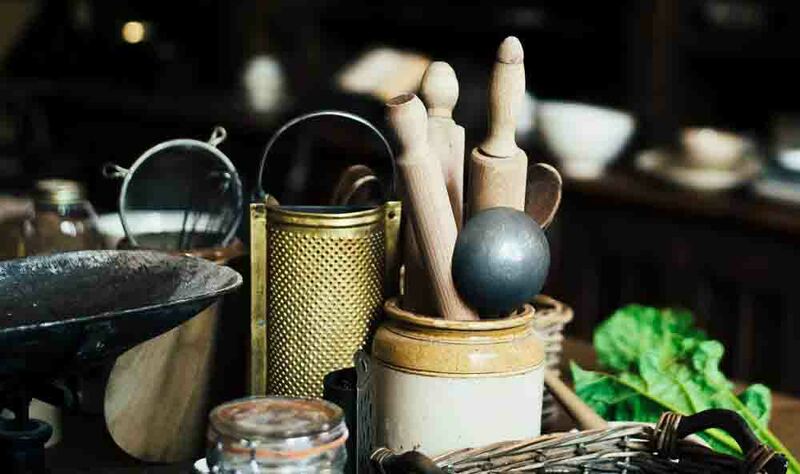 We have seen this combination used time and time again in different style kitchens. This combination is one of the preferred choices of leading design professionals worldwide, especially for white kitchens. 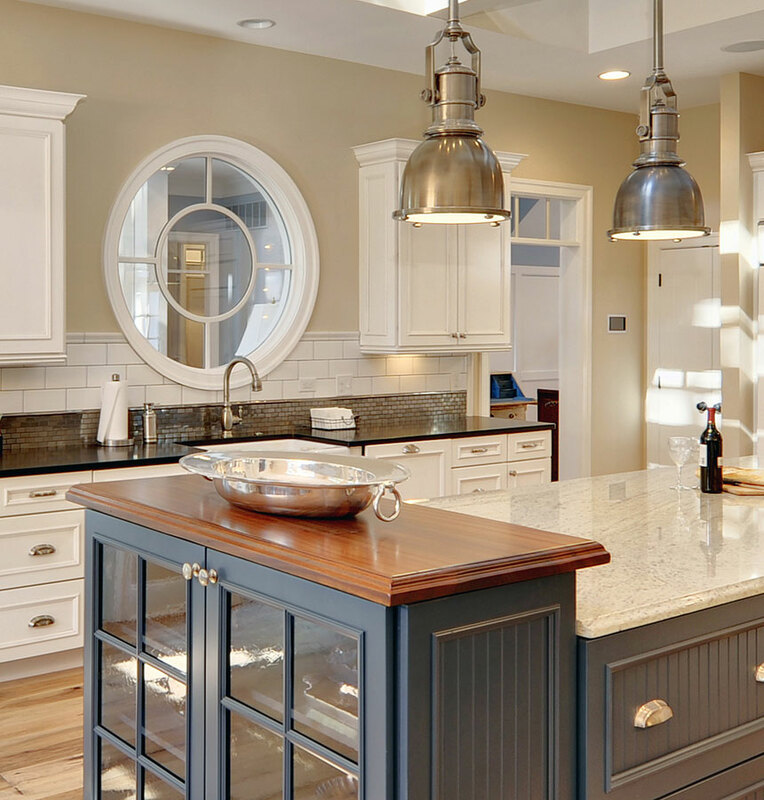 Kitchen styles including this combination vary from traditional to transitional and even modern. 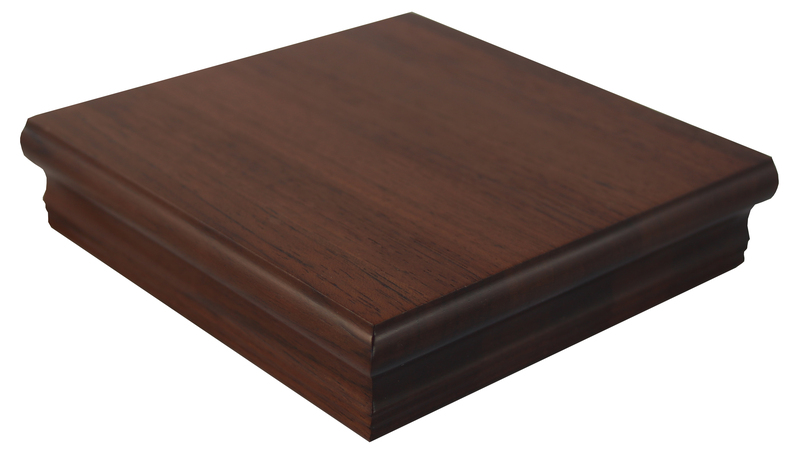 Why Walnut Counters with Cove Edges? Walnut wood counters are naturally rich in textural details and produces a large variety of figure types. 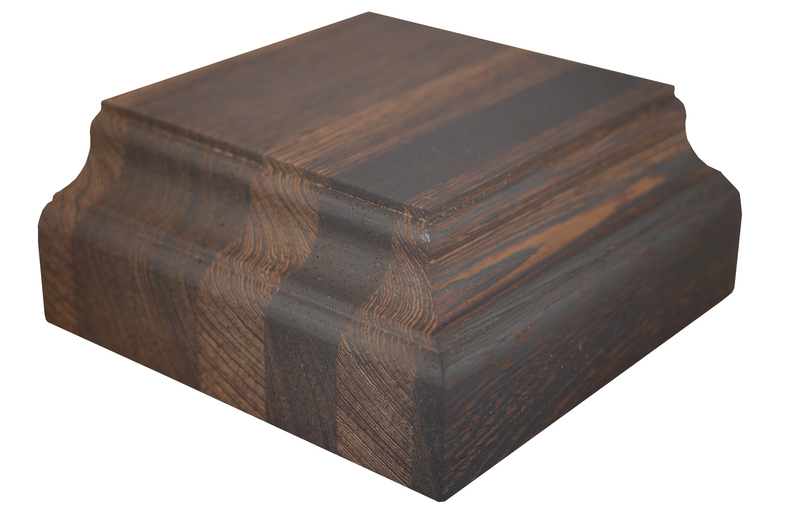 Walnut is a prized wood that is noted for its beautiful grain and warm, chocolaty brown color. 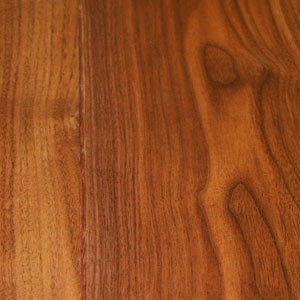 The sapwood in Walnut varies in color from white and yellow-brown. 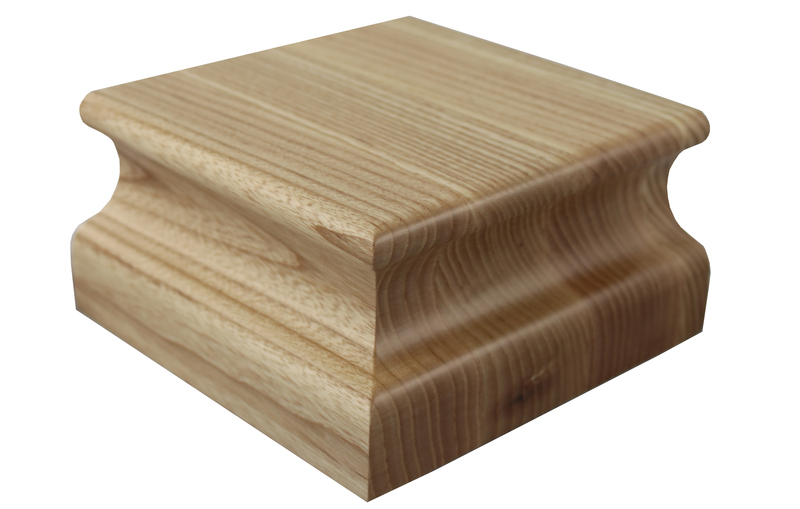 The Cove edge profile is a simple edge profile that is typically selected for the top horizontal edges of counters. Not only is it bashfully beautiful, but the Cove edge profile is also very easy to keep clean. 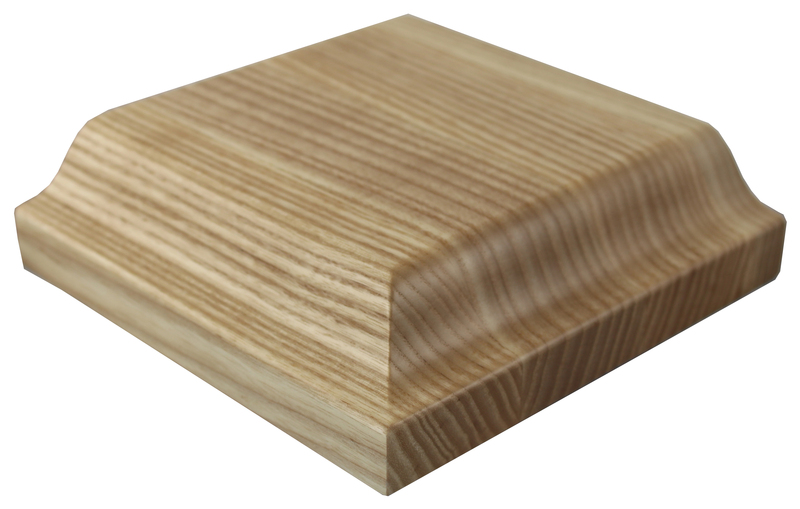 In order for a countertop to include a Cove edge, it must be at least 1-1/2 inches thick. 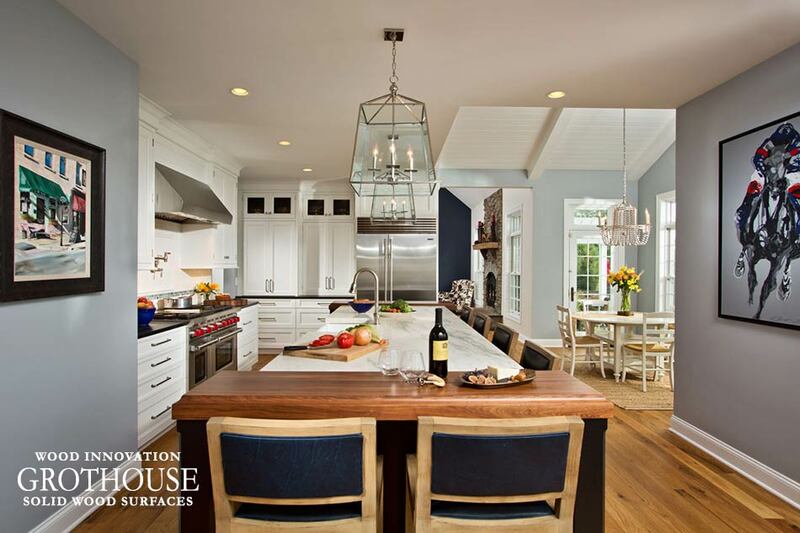 This white transitional kitchen was designed by Stonington Cabinetry & Designs for a home in Madison, New Jersey. The large kitchen island features a Walnut with Sapwood edge grain countertop with a 3/4″ Cove edge profile on the top horizontal edges. 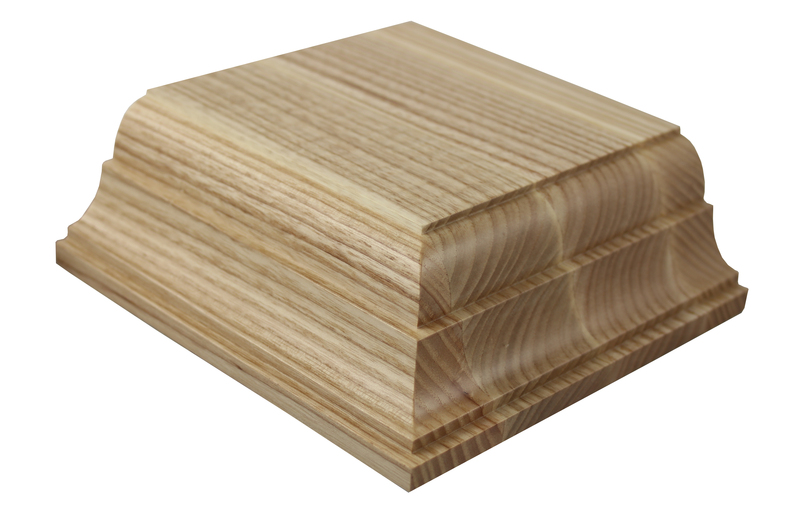 The bottom horizontal edges and vertical corners feature a 1/8″ Roundover profile. The simplicity of the Roundover enhances the detail in the Cove on the top edges. The natural Walnut wood characteristics are magnified and protected by Durata® Waterproof Permanent Finish in Satin sheen. 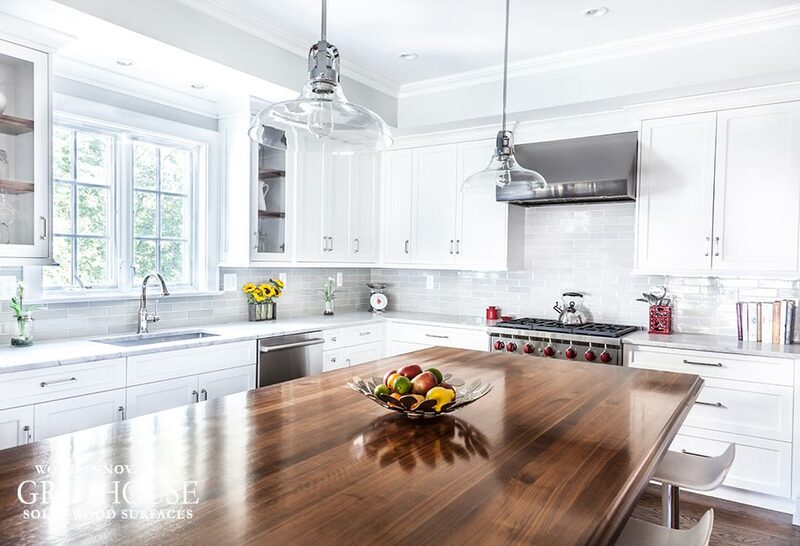 The Cabinetry Kitchen & Bath Design Studio designed a white traditional kitchen for a home located in Hingham, Massachusetts. 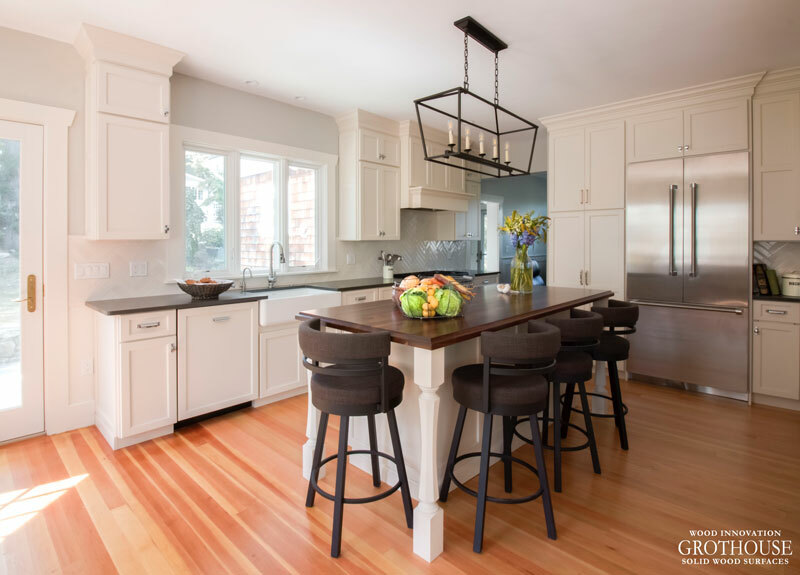 A large kitchen island takes the focus of this space, featuring a flat grain Walnut with Sapwood counter with a Cove profile on the top horizontal edges. 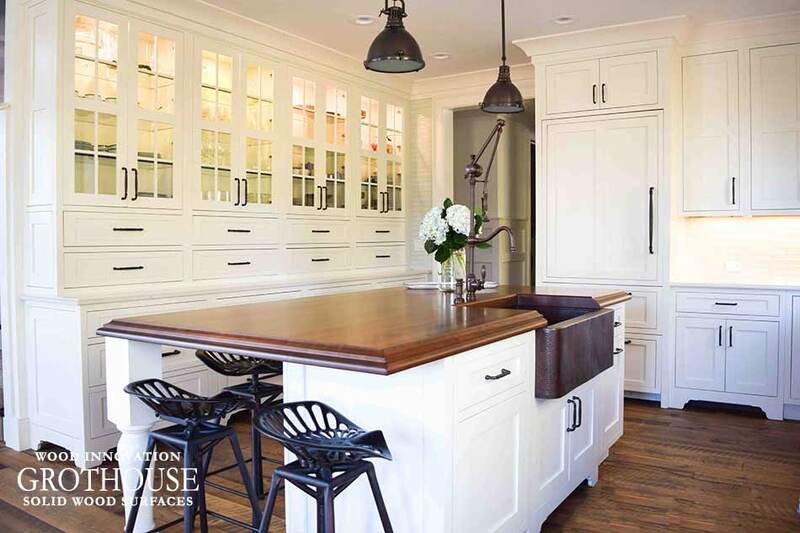 The rich browns in the wood contrast beautifully against the antique white cabinets and creates the perfect seating area for four. 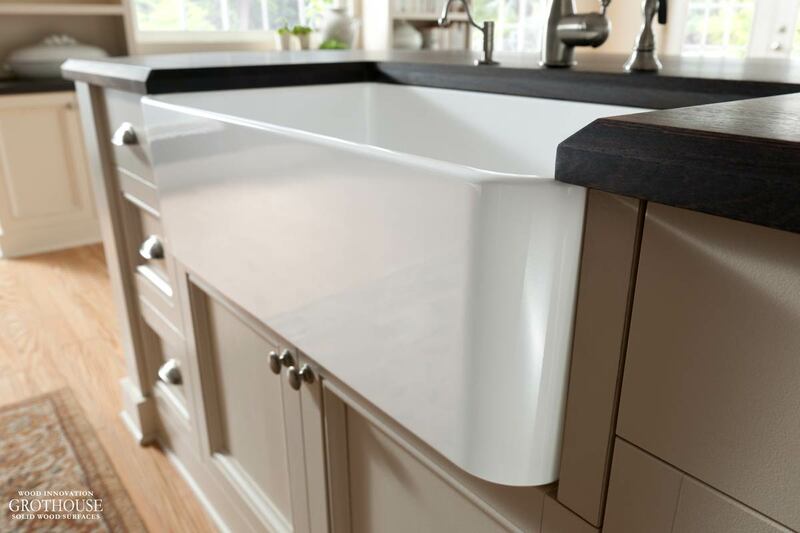 The Cabinetry Kitchen & Bath Design Studio selected Durata® permanent finish in Matte sheen for this counter. 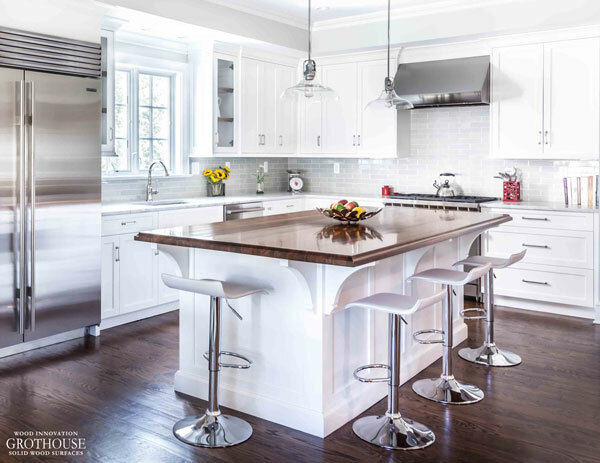 Visit the Grothouse Countertop Image Library in the Countertop Design Guide on our website to see more kitchen designs featuring Walnut Counters with Cove Edges. As the new year approaches, we look forward to upcoming 2018 countertop trends. From floating counters with hidden supports, to exclusive curated woods, countertop designs in 2018 are bound to be even more beautiful and functional than in years past. Design by Neena Corbin Kitchens Inc. Floating counters with corbels and angular support brackets are a thing of the past as we move into 2018. 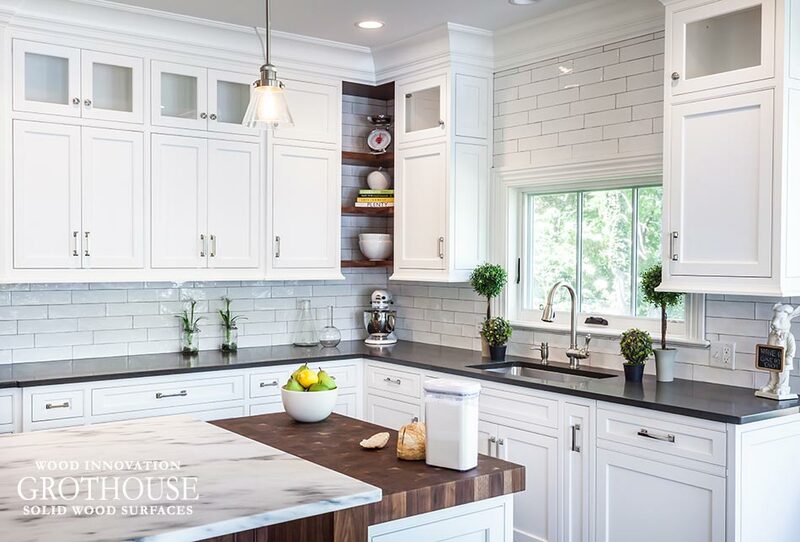 In 2017, about 40% of Grothouse wood countertops include some form of hidden support. Paul Grothouse predicts that this trend will continue to grow in popularity as we move into 2018. 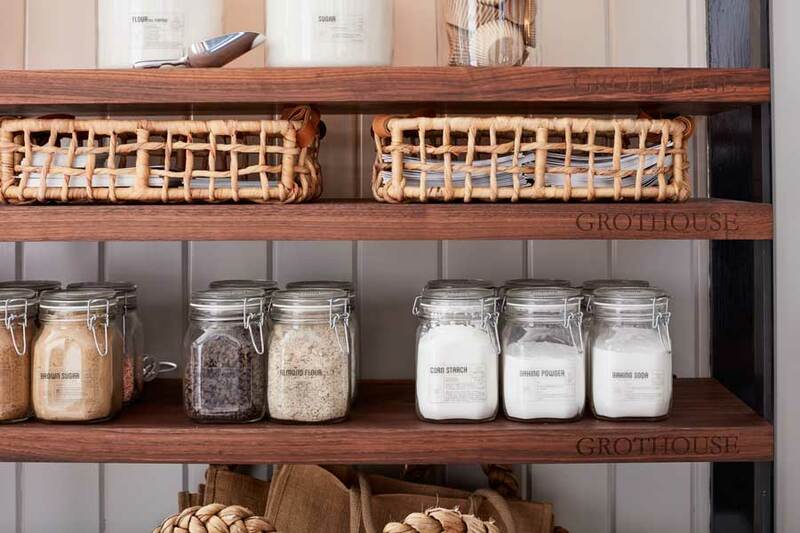 Kensington™ Wood is the second in a series of specially curated woods, hand selected and sourced by Grothouse. 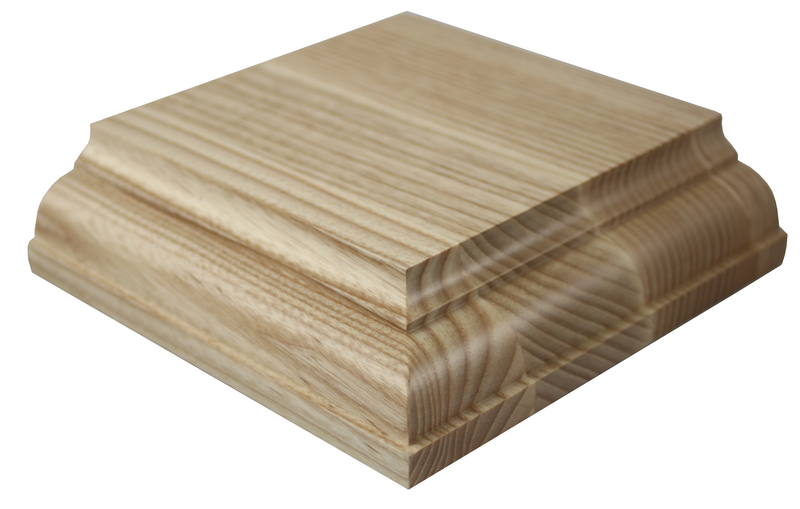 The wood is noted for its darker colors with action in the grain. Its striking visual appeal and lustrous finish will make this one of the top wood choices for designers in 2018. Homeowners are beginning to regret the open floor plans they have chosen. Though they love the look when they walk into the space, it tends to be loud and offers little privacy or individual spaces. This also requires expanding the floor plan in other areas to meet the needs not being met by the open floor plan. 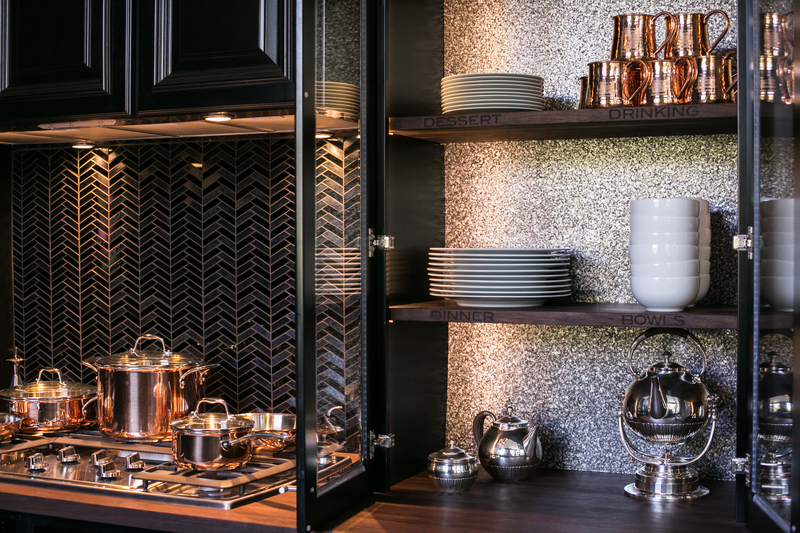 Creative room dividers like glass cabinetry to separate spaces will be used more often in 2018. Sound absorbing materials are a way for designers to combat this issue. 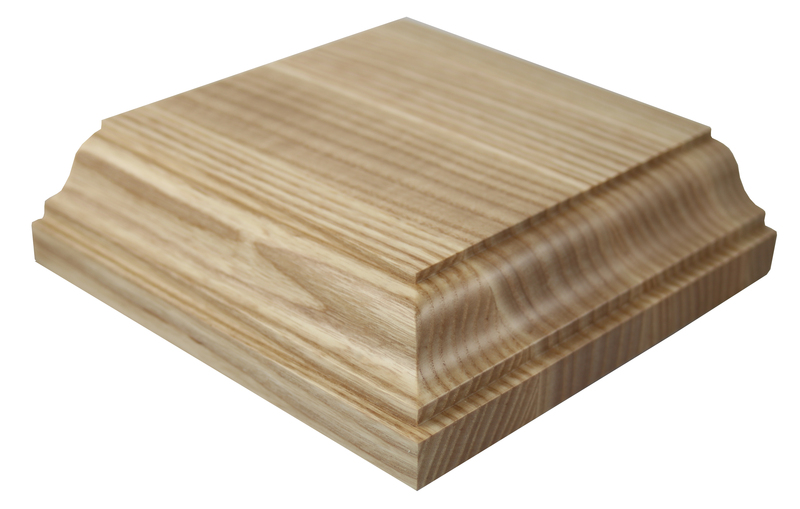 The best sound absorbing material is wood. 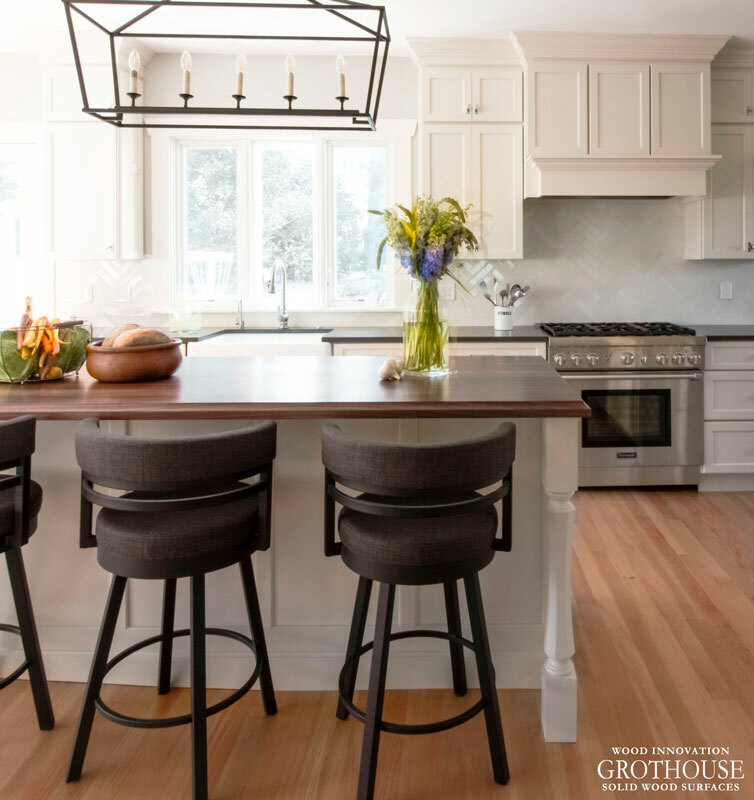 “Wood helps with quieting down a space because it eliminates sharp sounds when dishes and glasses are placed on it,” stated Jennifer Gilmer, CKD, of Jennifer Gilmer Kitchen & Bath, Ltd.
Stay tuned for more 2018 countertop trends as we enter the new year by liking Grothouse on Facebook and following @grothouseinc on Instagram! 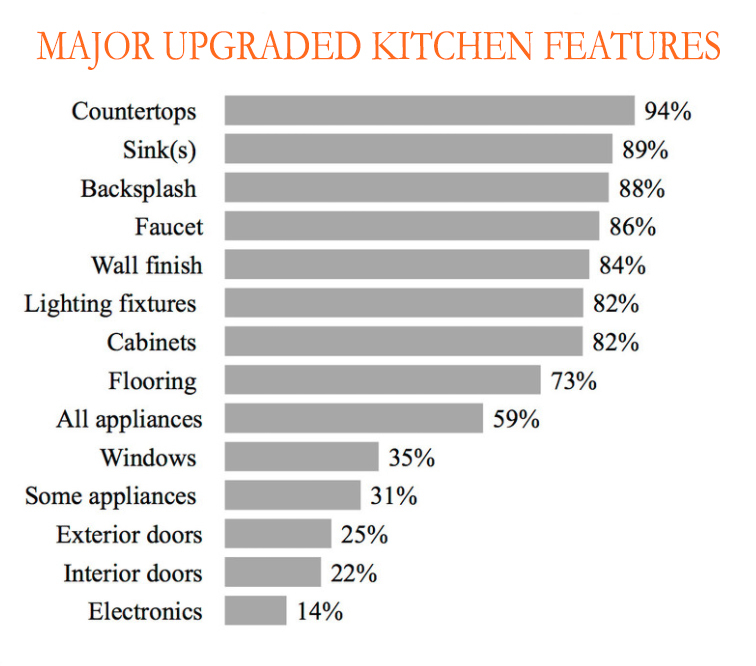 According to RICKI – The Kitchen Think Tank, countertops are the first planned kitchen purchase that U.S. homeowners plan to buy in the coming year, and we can see why. Kitchen countertops are a huge part of your daily routine. 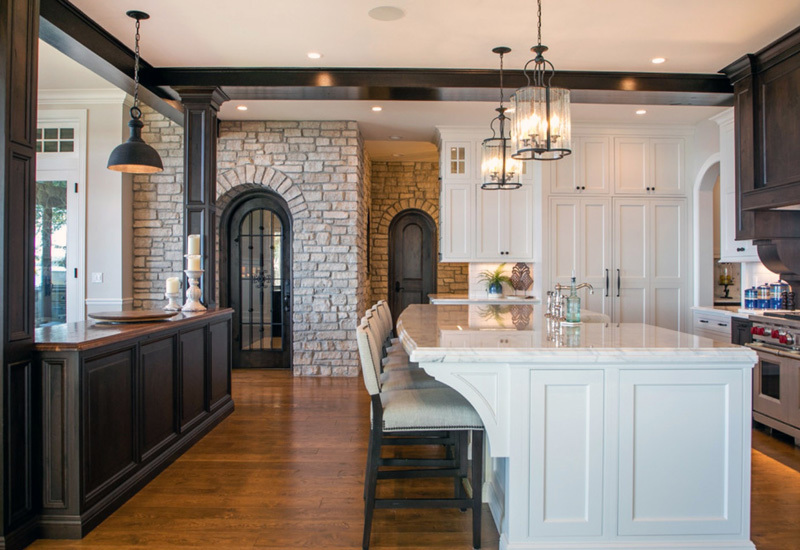 Whether you start your day by eating breakfast at the kitchen island, packing your lunch or preparing dinner, you are utilizing your kitchen countertops. Because they are so crucial to your everyday life, it is important that you consider purchasing a countertop material that suits your every need. 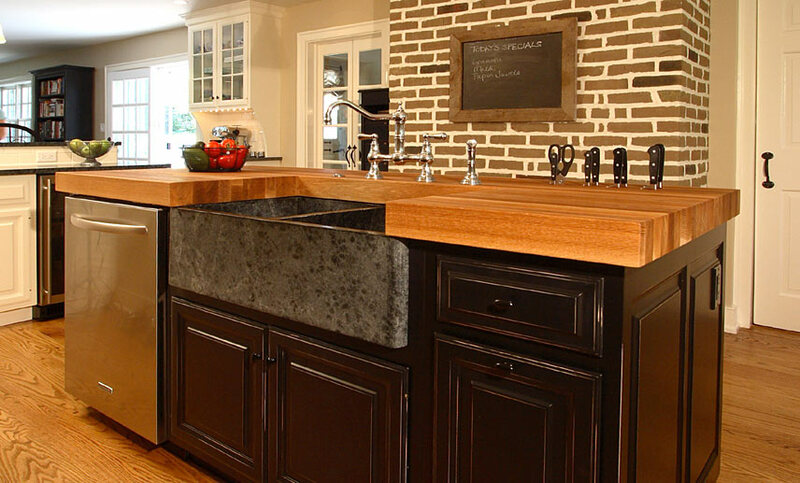 Contrary to some beliefs, wood countertops make for very versatile surfaces. They are not only kind to fine china and crystal, but can be sanded and oiled to look like new. Knife blades stay sharper longer, and wood is a naturally warm surface to cozy up to during any point in the day. 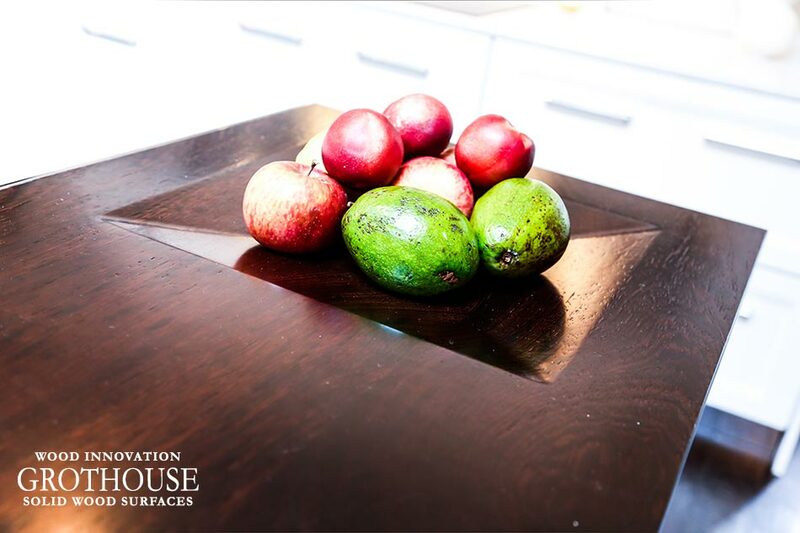 When crafted by Grothouse, wood kitchen countertops are covered under our lifetime warranty. Another advantage to choosing wood for your kitchen countertops is that they can be customized to your unique, personal taste. Choose from an assortment of over 60 wood species and a huge variety of features and options like laser engraving or integrated fruit bowls. Next in line after countertops, the first planned kitchen purchase, are kitchen faucets, refrigerators, lighting and backsplash. 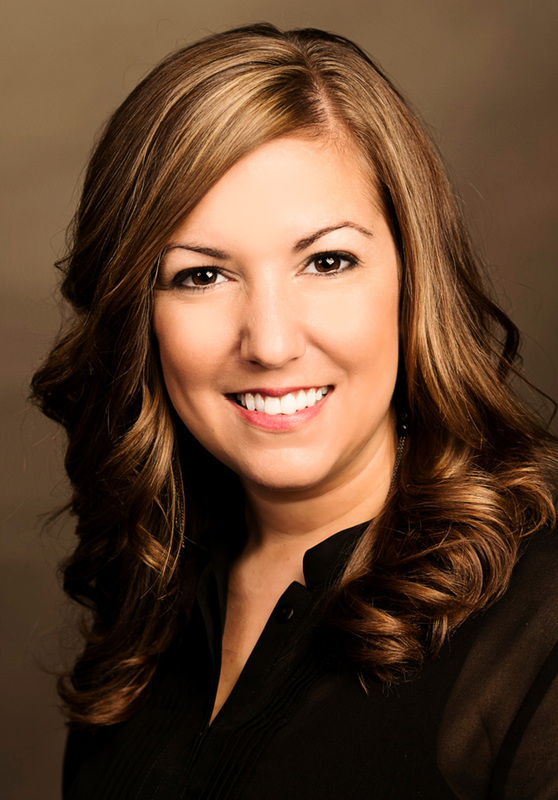 RICKI states that millennials are significantly more likely than their older counterparts to be planning to buy lighting for their kitchens, but we are hoping to have changed their minds. 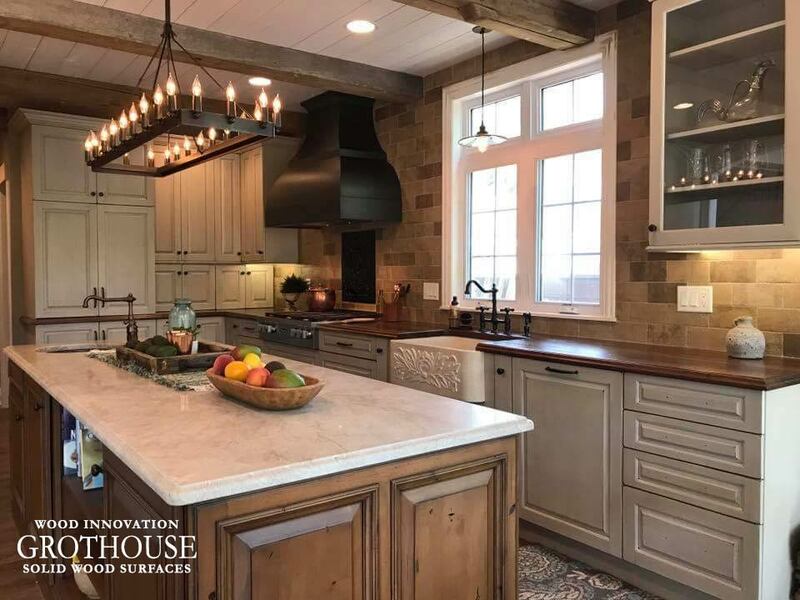 To see how some of the best designers in the industry design kitchens with wood countertops, visit the Grothouse Countertop Image Library and follow @grothouseinc on Instagram! 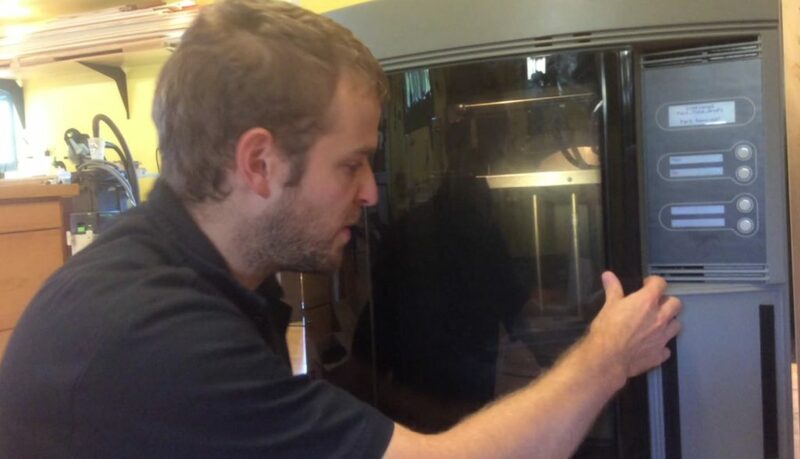 Grothouse introduces 3D printing to the shop. This printing process permits the crafting of unique prototype of custom items requested by our creative clients. Our engineer Steve demonstrates the innovative process to craft a wood record player tonearm prototype. The 3D printer uses a flexible, strong plastic material through a very small tip and puts it out in a pattern layer by layer. The machine goes back and forth layer by layer printing out exactly what we want before it goes all together. Once the part is done building, it is removed from the support layer. This particular part is too big for the printer, so we had to build it in two pieces. The parts are built with two separate joints that fit perfectly together to create one solid, functional piece. 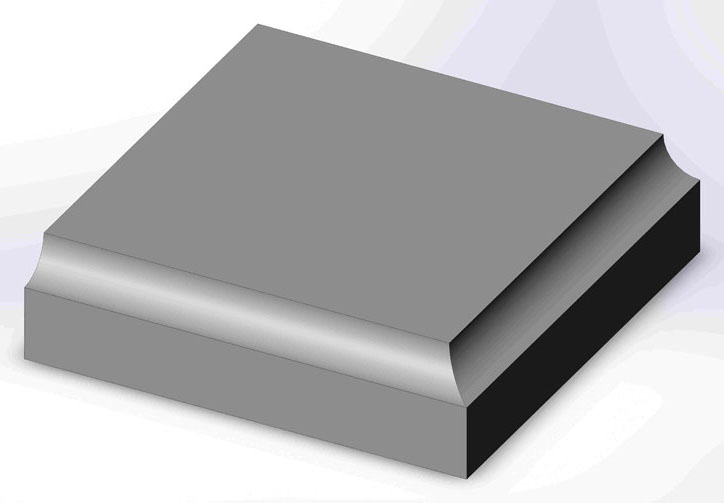 A perfect joint is created to join the two pieces. 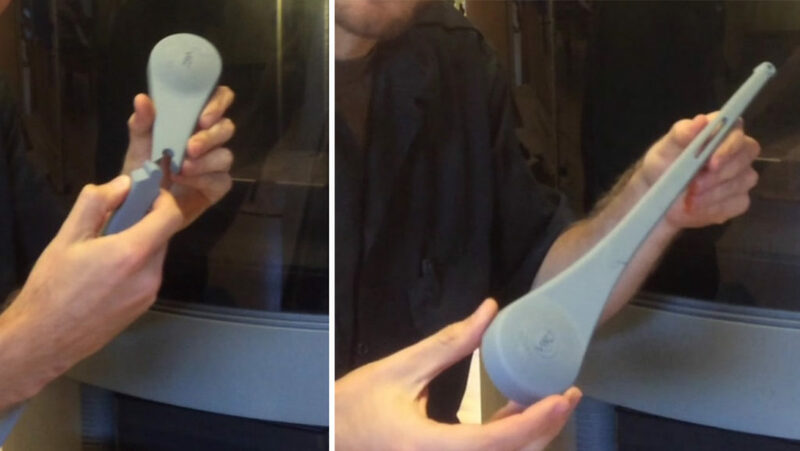 The customer will get the 3D printed example of the tonearm and try it out to see how well it works. 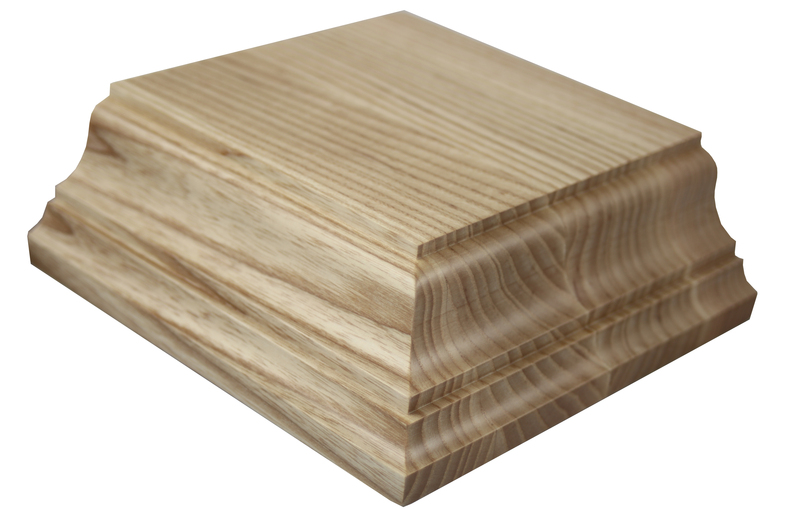 If everything goes well the customer will return the example to us and we will craft the entire piece out of wood. 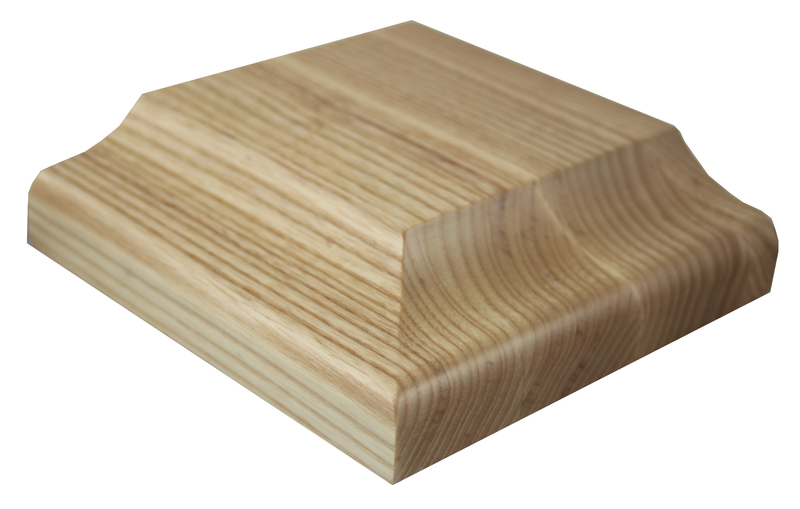 This allows us to reduce our overall costs to the customer and allows us to make sure that it fits properly and functions properly and the overall form is what the customer wants before making it out of wood. To watch the video of the 3D printer creating the record player tonearm, click here. Grothouse wood surfaces are known for their ability to be used for many different purposes, while exhibiting a stunning appearance. 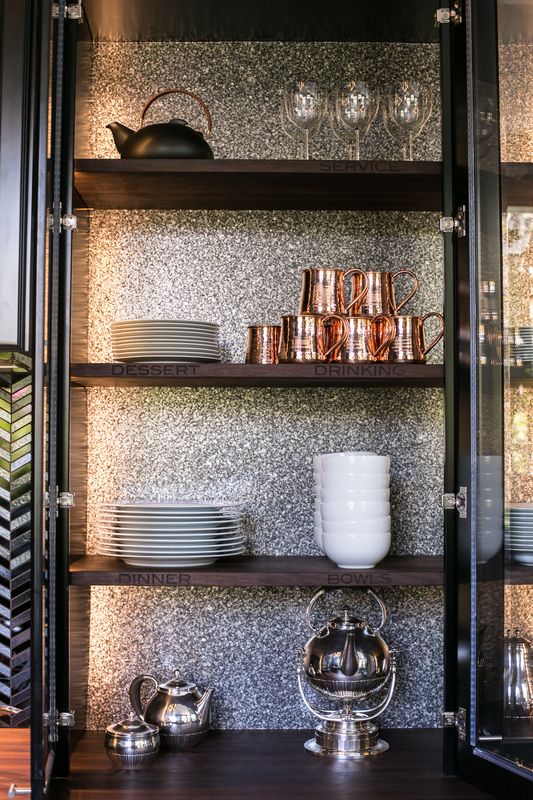 While most wood surfaces are crafted for food preparation or dining purposes, many designers incorporate accessorial wood surfaces as shelves for a place to store fine china, glass, or other decorative items. 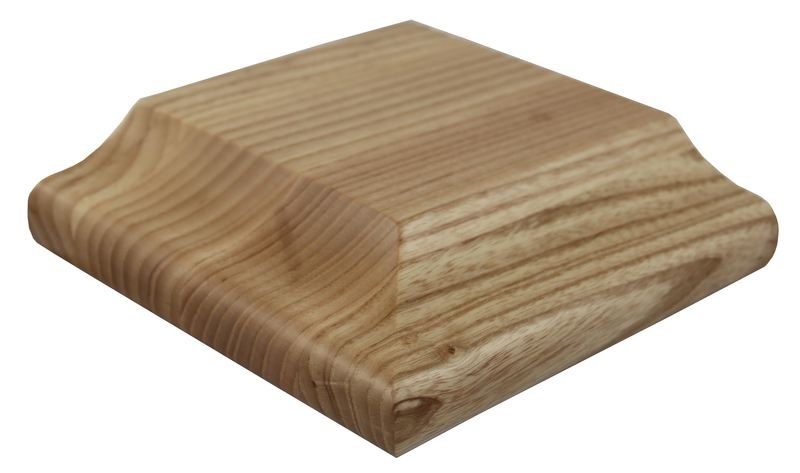 Grothouse crafts accessorial wood surfaces for any purpose and to fit any space. 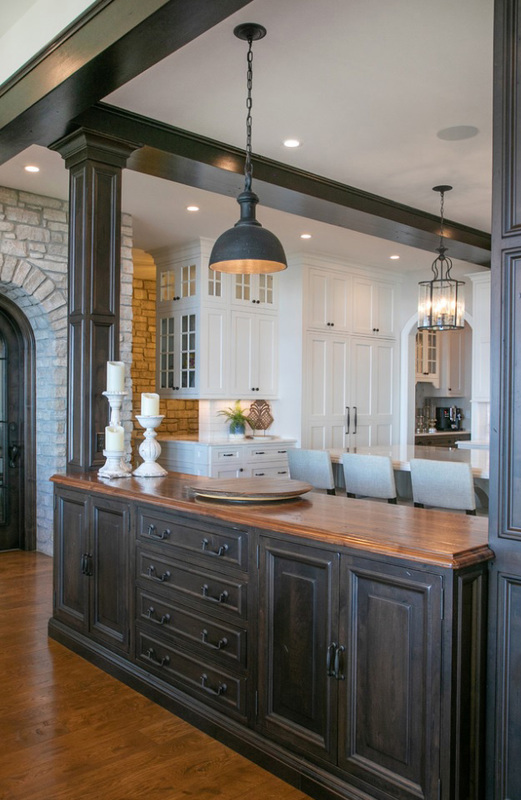 Some of the most talented kitchen designers incorporate accessorial wood surfaces into their designs. Steven Miller of Steven Miller Design Studio incorporated Peruvian Walnut wood shelves in his design for the 2014 House Beautiful Kitchen of the Year. The shelves match the main Peruvian Walnut wood countertop. Steven Miller added laser engraving to the shelves to label what was being stored in particular areas, for example “bowls” and “drinking”. Signature Custom Cabinetry designed the matching shadow boxes and cabinet surround box. 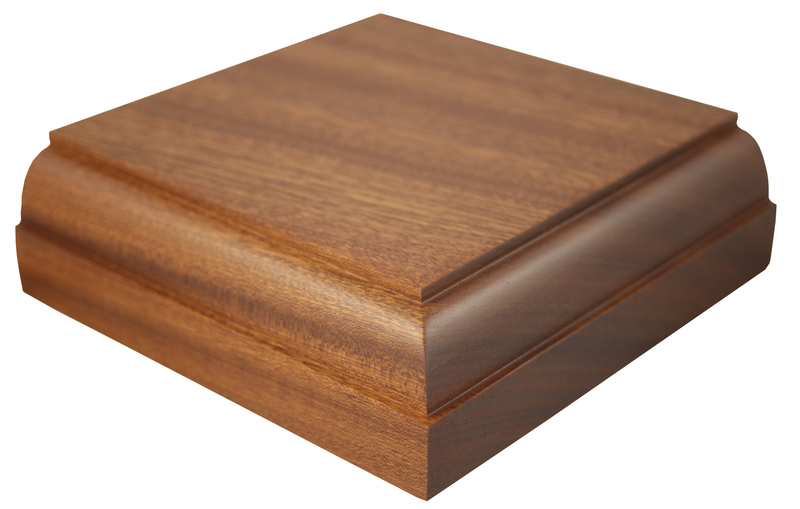 All boxes are made of Sapele Mahogany wood in edge grain construction. Shadow boxes are perfect for exhibiting decorative items, like picture frames. 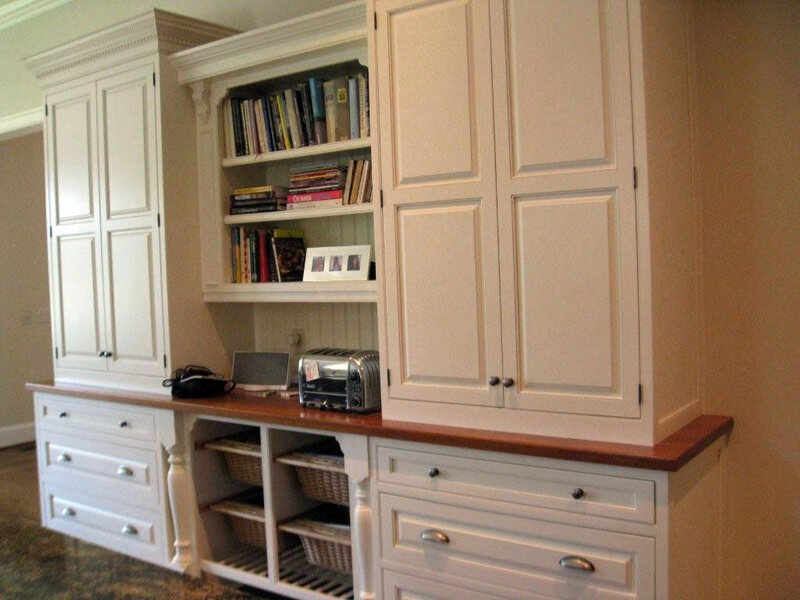 Cabinet surround boxes add a unique and appealing appearance to cabinetry. 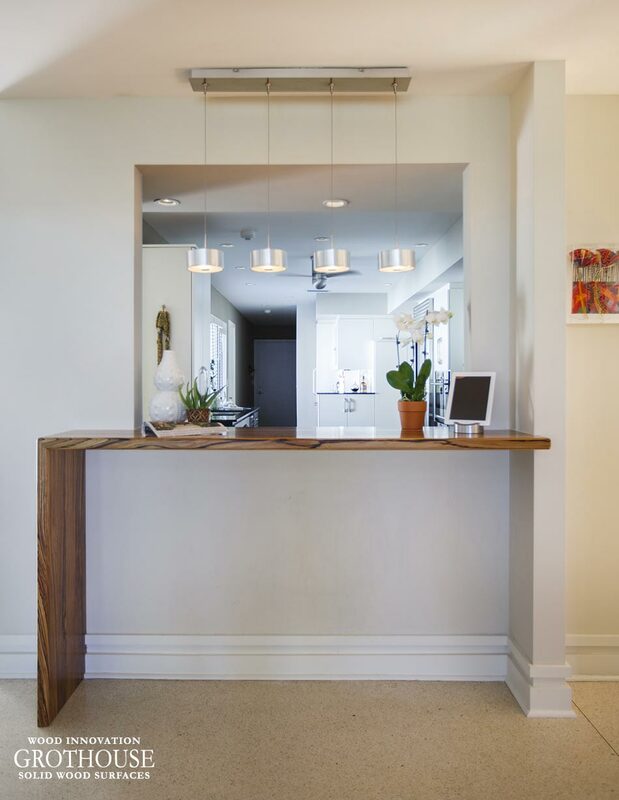 Elkay Manufacturing designed this White Oak counter to be used as a reception counter. 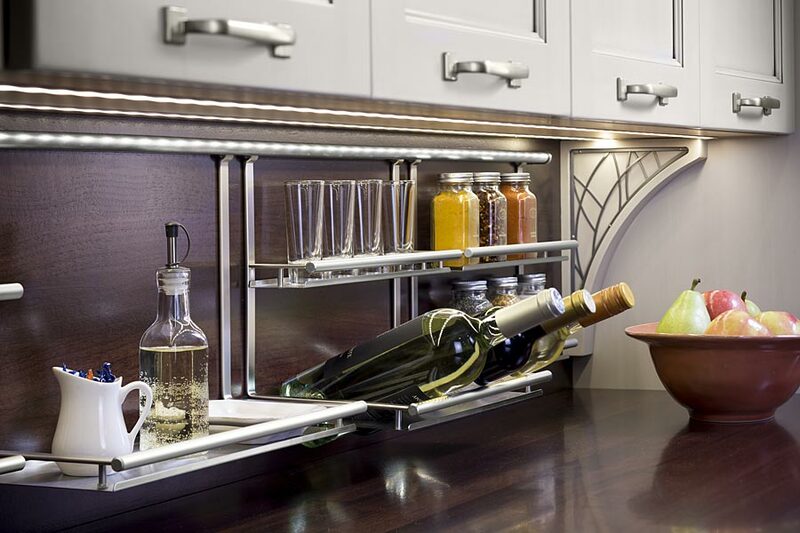 This design was featured in the Elkay Display Booth at KBIS 2014. The counter holds decorative items such as a clock, a bouquet of flowers, and a glass container with candy. 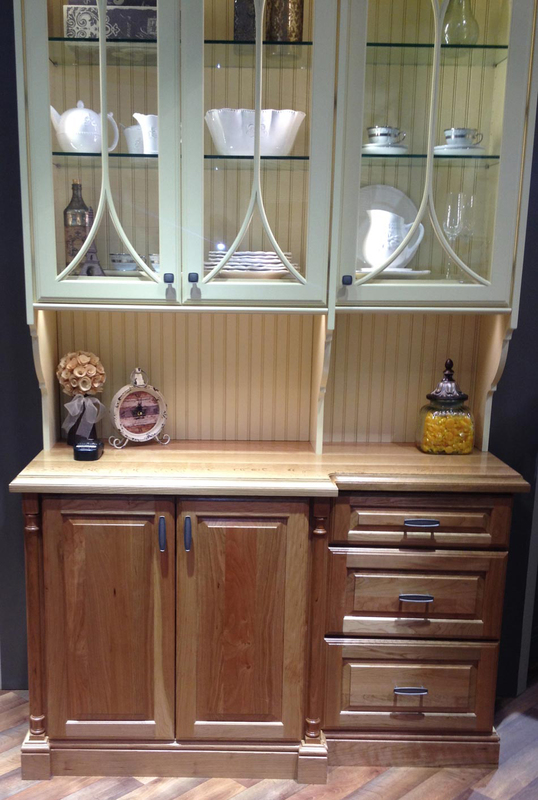 The Savannah Cabinet Shop designed this Teak wood counter for extra counter space in the kitchen and to hold items like a speaker and a toaster. 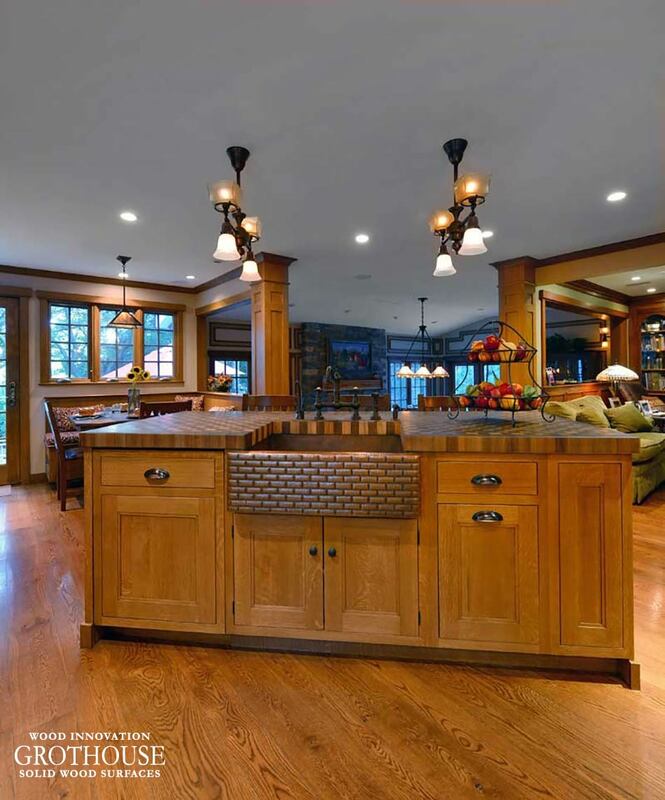 Echelon Custom Homes designed this Sapele Mahogany wood counter for extra counter space. It is used to exhibit the gorgeous silver dish placed on top. The wood counter makes that area the center of attention. It can also be used as an extra food preparation or serving space. 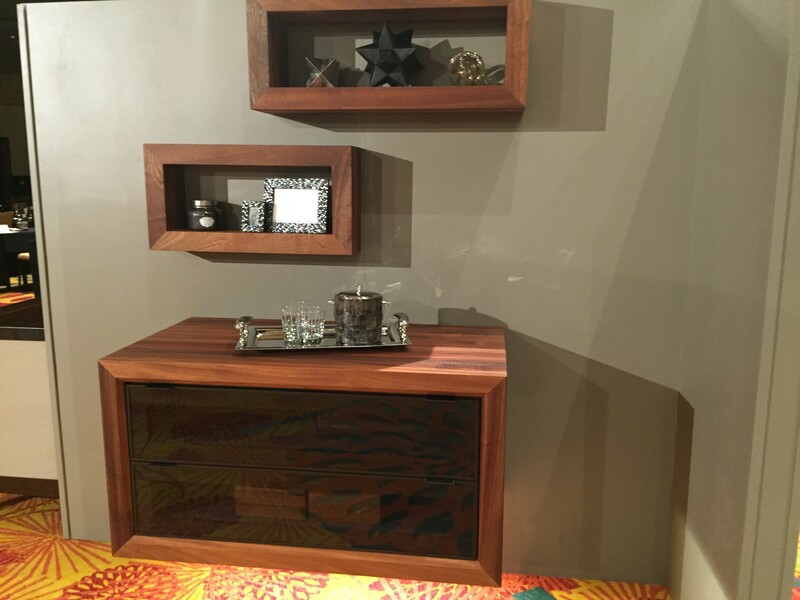 To view more designs of accessorial wood surfaces, follow our Houzz and Instagram pages. Be sure to like us on Facebook to stay up to date on Grothouse news and product updates!